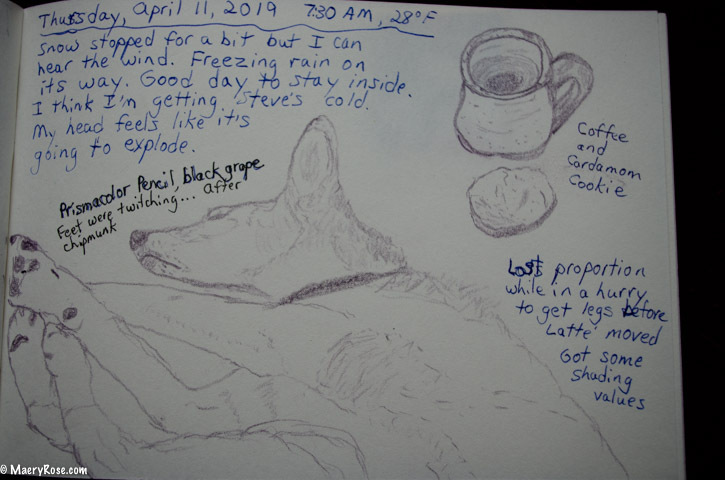 As part of my drawing practice, I’ve been sketching one of my dogs every morning, after I jot out my thoughts and To Do lists in my journal. 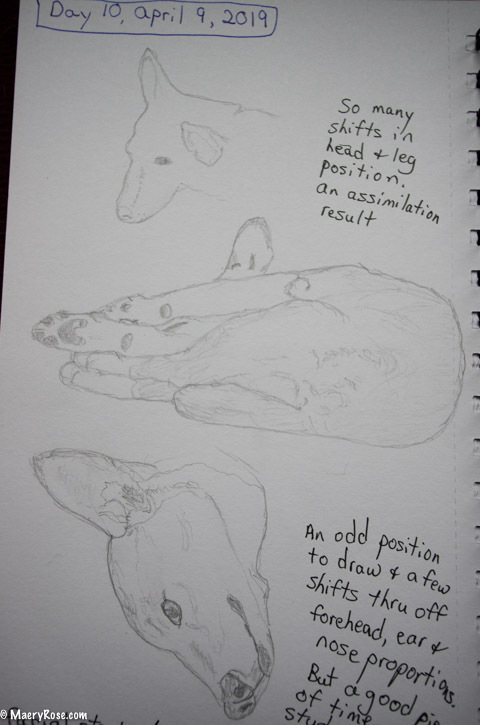 I think of these sketches as my Daily Dog. But without any training or knowledge about drawing, the improvements I wanted to make to my art (dare I call it that?) were secret knowledge that I didn’t know how to obtain. Then I stumbled upon a thirty-day, online, drawing class called “Drawing Live Subjects in Public.” I took this stumbling as a sign and registered for the class. I was familiar with the instructor, Roz Stendahl. I’d taken a journal making class from her, around 2008, before the big D. The participants made a journal from cut up paper and cardboard, and Roz gave us direction on how to use our journals to draw and document our days. 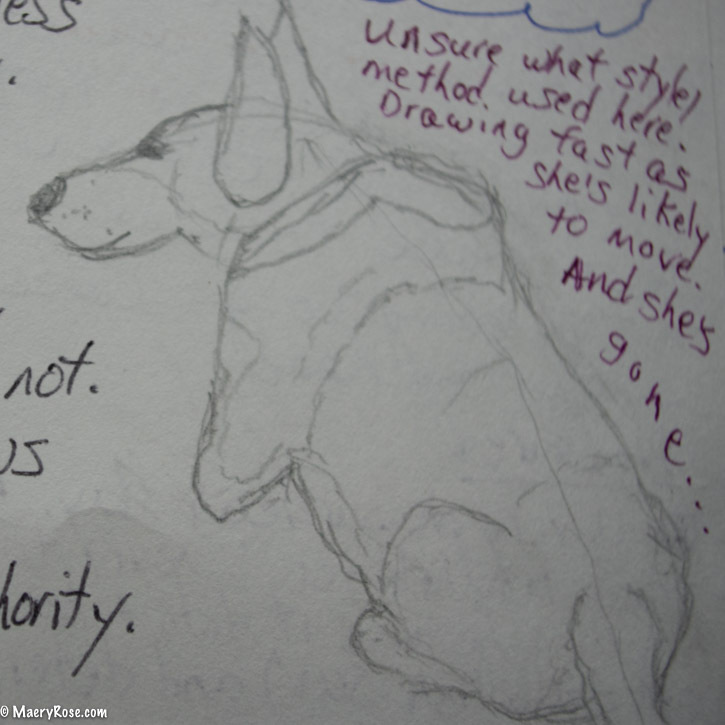 You can read more about what I learned at that time and see what I was drawing after that class here, in a post that was written about two months before I knew divorce was in my future. In April of 2009, I quit drawing. The stillness drawing required wasn’t something I could handle at that time. I only began drawing again this year, ten years later, and I began the daily thirty-minute drawing practice the class required with gusto. I was so exciting about having the things I’ve struggled with explained and demonstrated. I anticipated having my drawings change from simple outlines of subjects to more detailed views and seeing with an artist’s eyes not only when I’m drawing, but when I’m taking a walk and looking at the bark of a tree or the way the wind smooths one area of a pond while driving pointed triangles of water across another area. My shoulder mobility and strength progress is very slow. Physical Therapists keep giving me increasingly difficult exercises. So far, the only result I can detect is increased pain. Exercise and outdoor time should help with such things, so almost every day I do something like yoga, jogging, or walking the dogs. I struggle emotionally when I find that the things I used to do routinely are now difficult for me. But perseverance is something I am able to feel good about, so persevere I do. Steve is sick and I’m afraid of coming down with it too and that if I do, it will kill me. It’s similar to the fear you might feel crossing the street wearing an orthopedic boot when you see that a car making a left turn has not noticed you, and you know you cannot move fast enough to get out of the way. I should frame that last sentence from Roz and hang it in my office. I am such a newbie to making art or seeing and understanding artwork when I look at it. Many of my classmates are in my view already good artists. Usually by now, I would have told myself that I shouldn’t dare post my work amongst theirs. But I’m learning to be okay with the discomfort of never having done something before, not knowing how to do it and then doing it badly as best I can. Doing something incorrectly is a first step and taking that step is better than not doing something because of the fear of how it might not be “good enough.” Good enough for who? This drawing work is something I do just for me. It’s something I do because I’m curious. It’s a lot like writing — I’m never quite sure how what I create will turn out and I enjoy the surprise. Art journaling is another way of holding memories and being able to look back with appreciation at each day of my life. How little, commonplace, ordinary things make up my life, yet when I draw these things, I see how they aren’t ordinary at all! I mean, I now know my dogs faces and bodies to perhaps a creepy level. Latte’s ears, with their different hair color, hair growth directions, cartilage, folds of skin and dirt are frickin amazing! And don’t get me going on dog noses… Oh! And dog toes and pads and the fur between toes! With how much I have to read and figure out to prepare to do a 30-minute drawing assignment, I haven’t been writing much. I’ve been telling myself I need to focus on the class during April to keep up and learn as much as I can right now. While that’s true, I have felt unbalanced without a consistent writing practice. Writing is another way I capture memories. It’s how I find my way from one thought to another, until I’ve honed down to what is central. What is important. I think sometimes that it’s the way my wiser-self speaks to me and keeps me from imploding. But I’m writing right now. And I plan on writing again tomorrow. I’m eeking out those writing moments amongst all the other moments of coffee and cardamom cookies and sleeping dogs with twitching feet. I’m far from a positive thinker or Pollyanna type. I’m downright snarky. But I’m also older and I want a kinder, gentler, more generous life that attracts, rather than repels people. « A Former Self: What Would She Like to Do Now?